I had just moved from Boston to Georgia, didn’t know anyone, and so was spending all my time binging The Vampire Diaries on Netflix. Someone on Twitter pointed out that it was filmed in Georgia, and so I did a little Googling and found out that they were hiring extras! I submitted a photo and my info, and the next day I got a call asking if I wanted to work. I ended up doing several episodes of The Vampire Diaries (Ian Somerhalder talked to me! ), and later some episodes of the spinoff show, The Originals. I fell in love with the crazy behind-the-scenes stuff that was happening on set and all the people on the crew who worked to make the magic happen. And so when I was starting to write my fourth novel, I knew I wanted to use a lot of the stuff I’d seen and learned on set. A car pulls up to the stoplight in front of the cafe and screeches to a halt. It’s a compact, shiny black sports car, and right away I know the driver isn’t from around here. First of all, it’s about eleventy bajillion degrees outside, and the top of the convertible is up. And when the driver whips into a parallel spot directly in front of our sidewalk table, I know it for sure. Wilder residents have many skills, but parallel parking is not one of them, which is why there are always so many empty spots along Poplar Street downtown. The door opens and an older man steps out, his silver hair mussed, partly due to some intricate styling and partly due to the fact that he keeps running his hand through it as he glances up and down the street. His crisp, dark denim jeans, boat shoes, and white oxford tell me he’s not only not from around here, he’s from way out of town. I can see the shadow of his passenger through the dark tinted windows. His frantic gaze settles upon Nazaneen and me, though Naz is oblivious. At this point it would take a real live New York Met walking up to our table and sitting down to get her attention. I immediately wonder why a handsome, well-dressed guy in an Audi is asking for directions to the part of downtown Wilder where one would stash a body, if there were ever any actual murders in our tiny town. He stares at me, his eyebrows knit together to form a little canyon of skepticism on his forehead. Something about his clipped tone makes me think he’s not looking for any long answers, so I just nod. It’s not as big a deal as an actual New York Met, but it’s enough to draw Naz’s attention from her phone screen and her floundering team. We’ve just heard that a movie is going to be filming in our small, so-sleepy-as-to-be-in-a-coma home-town. Naz reaches for the card in my hand and flips it over, as if maybe she’s going to find the words “Just kidding!” printed on the other side. “A movie? For real?” she asks. “For real,” he replies. He sticks out his hand for me to shake. “Rob Lewin.” There’s a look on his face like maybe we might recognize the name, maybe even that we should, but I don’t. One glance over at Naz, who is giving him a purposely blank stare, tells me she doesn’t either. It’s not like we’re country bumpkins. We see plenty of movies, Once football season ends, it’s pretty much the only thing to do on a Friday night. And I could name most of the actors in them. I’ve just never really paid much attention to directors other than, you know, Steven Spielberg or Martin Scorsese (he’s a director, right?). “Like, a real movie?” I ask. “I don’t make fake ones,” he says. Naz is still not convinced. “Who’s in this movie?” She manages to keep her hands from making the implied air quotes, but her voice betrays her heavy skepticism. “Well, it stars Milo Ritter, and—” Rob begins. “Oh my God,” I blurt out. My voice comes out as a whisper, which is good, because I worried it would be a shout. “The singer?” Naz snorts. I know she’s thinking back to our slumber parties the summer between sixth and seventh grade, when we’d make up dances to Milo Ritter songs and perform them for her older sisters in their backyard. We both used to have a poster of him hugging a beagle puppy, his bright blue eyes and white smile beaming down at us from above our respective beds. He was only fifteen when he released his first album, so it was way too easy to crush on him. “Naz!” I stare wide-eyed at her. “What? It was like music to have a coma to,” she says, and shrugs. “The Diner,” Naz and I reply in unison. “Best burgers in town,” I tell him, and point him down the road and around the corner and give him strict instructions to order the onion rings. He climbs back into the sports car and pulls away. I feel light and tingly, like I’m in that hazy space between dreaming and awake. Naz, on the other hand, looks completely nonplussed. “You’re definitely having a stroke if you’re thinking of calling that guy,” she replies. Naz winces at the reminder of our impending separation. Even though I told her over and over not to, I know she feels guilty for leaving me. It’s not her fault the admissions committee immediately recognized her science genius but found my art two rungs below amateur. “I’m pretty sure doing nothing is better than getting ax-murdered by some ‘director,’ ” she says. This time she definitely hooks her fingers into air quotes. She snatches it from my grasp. “Lemme see about this.” She holds the card in one hand and her phone in the other, typing the name in with her thumb. Within seconds, the screen is filled with links topped by a row of photos of the man who was just standing in front of us. “Oh my God, is that—” I point, and Naz taps the tiny photo until it fills the screen with Rob in a sharp black tuxedo clutching a shiny golden statue. “Okay, so he might be legit,” Naz says. She clicks back and opens his ScreenData page. The list of credits for movies and TV shows looks endless—stuff he’s written, directed, produced. Some of the titles I recognize, but there’s not much listed that I’ve actually seen. Mostly stuff that gets talked about on the public radio station my parents listen to, mentioned in the same breath as all the major movie awards and festivals. Like I said, I like movies, but I’m not much of a film buff. But just from looking, it’s clear he’s definitely legit. I take the business card back from Naz and stare at the text. I may not have a best friend, and my future may still be in question, but I may have just solved the summer-plans problem. 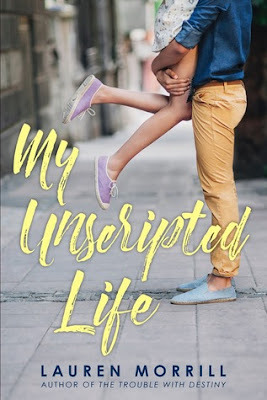 Description: Perfect for fans of Jennifer E. Smith and Huntley Fitzpatrick, you'll love this funny and sweet contemporary romance about a Southern girl ready for a ho-hum summer until she meets the boy of her dreams who happens to be an international pop star. It's not like Dee will be sharing any screen time with Milo—she's just a lowly PA. And Milo is so disappointingly rude that Dee is eager to stay far away from him. Except after a few chance meetings, she begins to wonder if just maybe there's a reason for his offensive attitude, and if there's more to Milo than his good looks and above-it-all Hollywood pedigree. Can a relationship with a guy like Milo ever work out for a girl like Dee? Never say never. 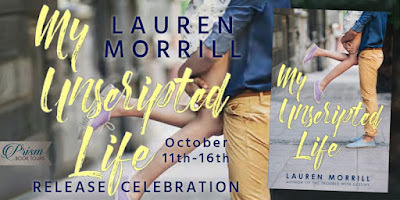 . .
Lauren Morrill is the author of YA novels Meant to Be, Being Sloane Jacobs, The Trouble With Destiny, and the forthcoming My Unscripted Life (Oct 11, 2016). 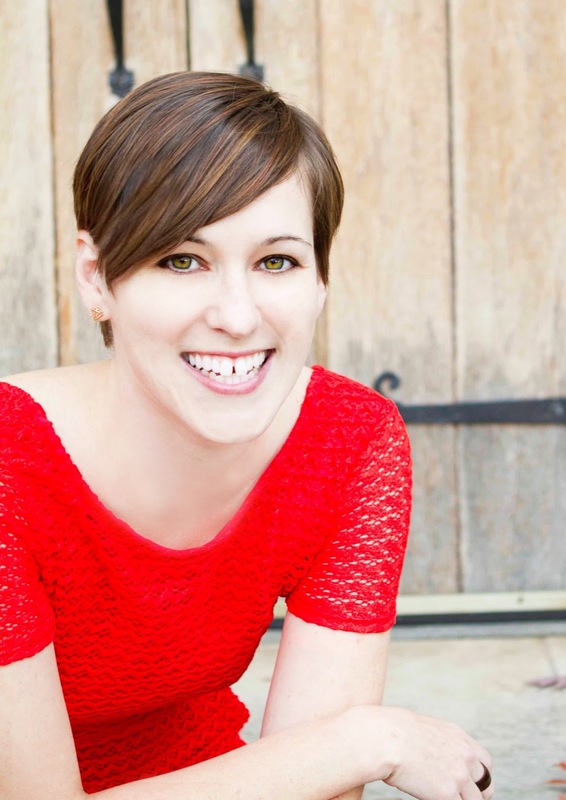 When she’s not writing, she’s busy stalking the shelves of the bookstore and the library in Macon, GA, where she lives with her husband and son.